Tonight at sundown begins Independence Day. We celebrate that great day in 1948 when Israel became a country once again. Tonight we will be going to the fireworks and tomorrow everyone will be cooking out. The parks will be full of families and friends celebrating and all the stores, etc. will be closed. We are so thankful for G-d’s supernatural intervention to restore the State of Israel. Let us pray for her, as she is threatened on all sides. Beginning at sundown today (so technically tomorrow) is Memorial Day here in Israel. All stores close early today, all public transportation stops, and all regular television broadcasting ceases. This is a day when we remember the fallen soldiers who gave their lives to protect and defend Israel. It is such a tiny country, and each death is felt by everyone. Let’s all pray for the families. Tonight and tomorrow there will be special ceremonies, some of which will be broadcast on television. These are very moving, and they tell the story of various soldiers and how they died. 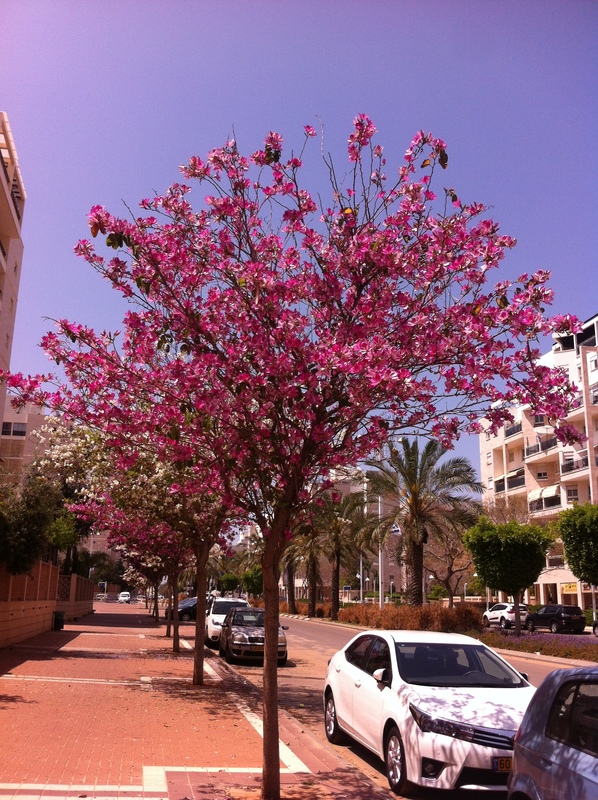 Spring is a beautiful time in Israel. The trees and flowers are all in bloom and the days with rain are almost over until fall. Most people say that there is no rain after Shavuot, which this year begins at Sundown, May 23. This week we have two holidays. Tuesday night to Wednesday night is Memorial Day. This of course is a sad day in which the siren is sounded for a minute of silence and special ceremonies and television programs are aired. Then, Wednesday night, the sadness turns to joy as we celebrate Independence Day. In the center of our city, there will be bands, fireworks, food trucks, etc., to celebrate the day. Beginning today at sundown is Holocaust Memorial Day. All regular television programming ceases and there are either stations shut down or they broadcast special Holocaust programs. Tomorrow morning, at 10:00 am, a siren will sound for 2 minutes throughout the country for 2 minutes of silence. During this time, drivers in towns and on highways will stop their cars, get out, and stand next to them in memory of the 6,000,000 Jewish people killed in the Holocaust. People in stores and cafes will stand still for this time also. It is very moving to see this and to participate in it. We want to announce that we are now have our own channel on Roku and will soon be on Google TV and Amazon Fire TV. We hope that you will share with your friends about our broadcasts and our website! Hopefully, most of you know that you can see Baruch’s teachings on our website and also on CTN which is broadcast on Dish Network (channel 267) and DirectTV (channel 376). The television broadcasts are aired on Sunday mornings at 11:30 am eastern, 10:30 am central, 9:30 am mountain, and 8:30 am pacific. Pesach Sameach! We hope that your Passover is going well. Israel is in a very festive time. We are so blessed this year to be able to walk along the Red Sea! In Israel, there is only 1 seder and only the first day is a Yom Tov.It is nice to be able to go out to eat or to the grocery store and have a huge selection of kosher for Pesach foods. The restaurants, even McDonald’s, etc., have Pesach menus with special buns and breading for the chicken sandwiches. In Israel, there is only 1 seder and only the first day is a Yom Tov. This is a day which is treated as a Shabbat. This year the first day happened to fall Friday night to Saturday night, so it was a Shabbat and a Yom Tov. Outside of Israel, the second day is also treated as a Yom Tov. So that means that in Israel you would see everyone carrying out normal activity beginning Saturday night, whereas outside of Israel, the observant ones would not do so until Sunday night.